This luscious, fluffy, frothy concoction of summer flowers includes the types of blooms you would find in nanna`s garden, including dahlias, stock and lisianthus. Available in a variety of colour combinations, you can order this beautiful bouquet via our online florist shop, by emailing directly to sales@flowersforeveryone.com.au or calling our floral consultants on 1800 66 66 46. 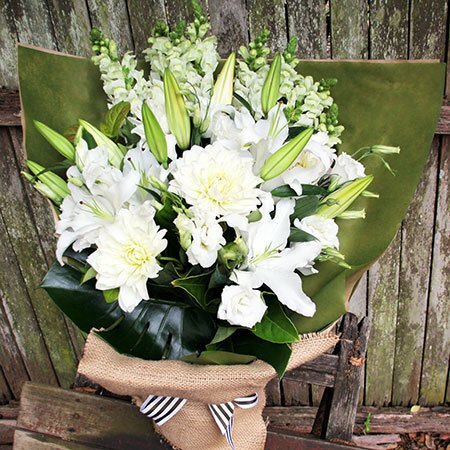 PLEASE NOTE: Due to seasonal flower availability the pictured bouquet DESIGN and PRICE is available for delivery in Sydney, Melbourne & Perth Metro regions only. To order these flowers delivered in Sydney or Perth, please go to the relevant city under LOCATIONS. For a similar style flower bouquet delivered outside these locations, please ENQUIRE DIRECTLY on 1800 66 66 46 or email sales@flowersforeveryone.com.au for suggestions and a custom quote based on your delivery location. Our fabulous team can then place an order on your behalf via our affiliate florist network.